Depart from your Shanghai hotel in a comfortable, air-conditioned minivan and venture to the airport to board your flight to Xi’an. 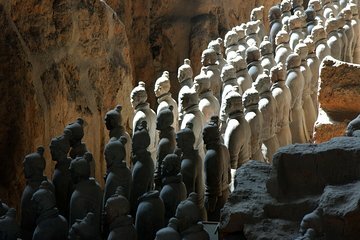 On arrival, greet your knowledgeable guide and head straight to the Army of Terracotta Warriors, a magnificent mausoleum housing Emperor Qin Shi Huang, whose reign began in 246 BC. Hear of the incredible archeological excavation’s rich history and capture photographs of the 6,000 warriors. Revitalize with a traditional Chinese lunch then head to the Xi’an city walls, ancient structures that date back to the Ming Dynasty. Tour the well-preserved walls with your guide and learn about how they functioned as impenetrable military defenses. When your tour comes to a conclusion, return to the airport in a spacious vehicle and board your return flight to Shanghai. On arrival, travel back to your hotel with impressive memories of your sightseeing experience. It was a privelege to have been given the opportunity to do this tour. The driver arrived just before 5.30 am at my hotel to whisk me to Pudong airport. The tour guide, Maggie, met me two and a half hours later in Xi'an. I immediately felt comfortable in her presence. Her command of English was very good. The driver was less approachable though. We made an initial stop at a factory that made Warriors. I was shown the process by a different guide and was given the opportunity to buy a photo. There were other items on sale too. After an interesting tea ceremony of which three could be tasted free of charge, we left for the Terracota Warrior 'Museums'. On arrival, we had lunch which was actually very good and there was plenty of it. Our next stop was the highlight of the day - the three pits of warriors and the bronze museum. All were very interesting in their own ways. The area is extensive and requires significant walking. It was 31 degrees the day I was there. Don't expect to see all the pits full of warriors. Only one has around a third visible to the public. The rest have not even been excavated yet. The bronze museum is excellent with several key pieces in cabinets. I bought souvenirs in the museum shop which were of a high quality. Unfortunately the time allocated here was all too little. We proceeded to a pergola and calligraphy lesson which were amazing. These were not included in the price of the tour. I believe I paid for both myself and the guide too. After scaling the city walls in Xi'an in very high temperatures for a short time at my request, we ate dinner in a local restaurant which was a superb taste. Bizarrely, this again was not included in the price of the tour. At around 7.30 it was time to head back to the airport. Maggie left us after giving a day of great commentary and good fun. Despite being booked by the agent on the last flight back to Shanghai and with an hour and a quarter delay, the driver in Pudong airport turned out at 1.30 am to see me safely back to my hotel. He went above and beyond the call. This was an expensive one on one tour and is a one off. The long day was not an issue due to how much was experienced. I wouldn't have missed seeing the Terracota warriors though for anything. It was the highlight of my two weeks in Shanghai. I thoroughly recommend this if you want to see what has been described as the next 'wonder of the world'. As others have stated, it is a long day. They picked you up very early, in my case 4:50 am and dropped you off at my hotel after midnight. When they picked you up from your hotel, they give you your airline tickets and info on who will meet you in Xi'an. The departure time is a bit stressful as it does not give you much time at the airport in Shanghai. I literally got to the gate as they were calling to board the plane. So maybe a pick up of 4:30 would be better. My guide in Xi'an, Lucy, was great. Our first stop was store selling clay warriors. Interesting place. Some of you may be turn off by the idea but I would suggest you go. No need to buy anything but a great place to take picture with the replica warrior as you will have to pay extra at the site. I had lunch and they we visited the famous Army of Terracotta Warriors. As it was off season, it was easy to walk around the pits. There are 3 pits and the most impressive pit is the first one and it has a lot of different warriors. the Xian city walls was also interesting. I wanted to ride the bike around the wall but the smog in the city was really bad so I only walked a bit. Very long day, but worth doing it, if you have only 24 hours. No doubt the Terracotta Army is the highlight. I enjoyed a lot the biking along the city wall as well. Great tour. The sights, of course, are spectacular. In terms of the tour, the guide was excellent. Very personable and very good English. Arrangements were great. Pickup at my hotel and transfer to the airport. Pickup at Xi'an airport. Pickup back in Shanghai and return to my hotel. All were professionally handled. Highly recommend this tour. driver pick up got us to airport at boarding time. Risky pick up time, too long at factory decreased time at warriors. flight back slightly delay but 30 minutes looking for driver back to ship could have been better organized. We had trouble working a visit to the warriors in our itinerary so took advantage of this one day trek. It was a very long day and expensive but we would not have missed the opportunity to see the site. It was breathtaking to say the least. Pictures cannot convey the magnitude of the pits. The fact that each warrior is different is mind boggling and the exacting detail of each warrior is truly spectacular. We also were very impressed with the tour of the city walls of XI'an.